A painting by Eugène Gabritschevsky. Photo credit: Yannick at Flickr Creative Commons. Eugène Gabritschevsky, born in 1893, was a Russian artist and biologist from a family of noted scientists. His father worked with Louis Pasteur and Robert Koch, and Eugène built a solid career both in Russia and the United States before his thirties. And then at 38, he had a nervous breakdown. He spent the rest of his life in the Haar-Eflingen psychiatric hospital in Germany, painting. In the thirty years he spent in that hospital, Gabritschevsky produced thousands of paintings and drawings. In his early years, he painted academic-looking illustrations of corals and human figures. But his condition (diagnosed in 1931 as schizophrenia) worsened over the years, and his artistic choices changed. 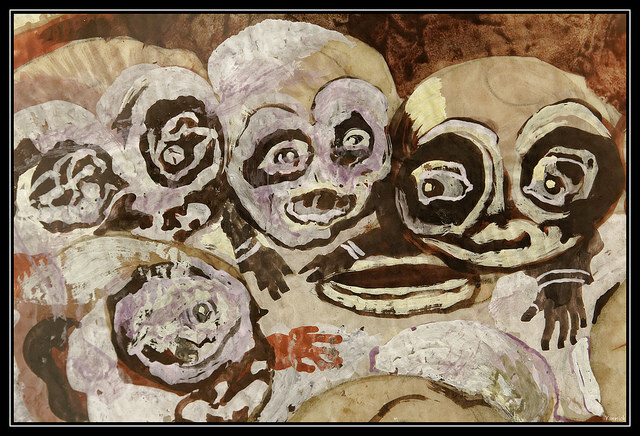 He began painting ghosts and monsters, and small, eerie figures like twisted small humans. Gabritschevsky’s name is still lauded in both science and art, nearly forty years after his passing. His papers on cellular mutations in insects are stll cited in biology and genetics research. And his paintings of ominous mutated people still hang on museum walls and adorn album covers. For instance, the American Folk Art Museum recently featured an in-depth exhibition of Gabritschevsky’s contributions, which included more than eighty of his drawings and paintings, a film about his life, and many of his publications from both before and after his breakdown. 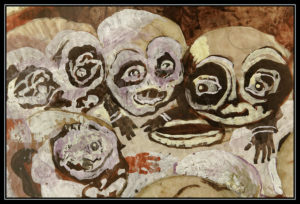 The art was pulled from collections belonging to Collection de l’Art Brut, Lousanne, and La Maison Rouge in Paris. New York curation was done by Valerie Rousseau, PhD. The exhibition, titled “Eugen Gabritschevsky: Theater of the Imperceptible,” is an illuminating illustration of the ways in which schizophrenia alters the world around a person.